Mumbai: Prin. L.N. Welingkar Institute of Management Development & Research (WeSchool) in association with National Commission for Women and Bharatiya Stree Shakti hosted a seminar on ‘Efficacy of Laws pertaining to Property and Marital Rights in Different Religions in India’ on Saturday, 18th March, 2017. The seminar was inaugurated in the presence of Vijaya Rahatkar, Chairperson, Maharashtra State Commission for Women, Prof Dr Uday Salunkhe, Group Director, WeSchool, Meeratai Khadakkar, Prin. Judge ( Retd), Family Court, Nagpur; and Kumudini Bhargav, National Secretary, Bharatiya Stree Shakti. The seminar was aimed at a concerted effort to study the strengths and weaknesses and to extract the best from Personal laws governing different religions and to suggest required changes. It saw participation of delegates across Delhi, Madhya Pradesh, Chhattisgarh, Gujrath, Himachal Pradesh, Punjab and Maharashtra. 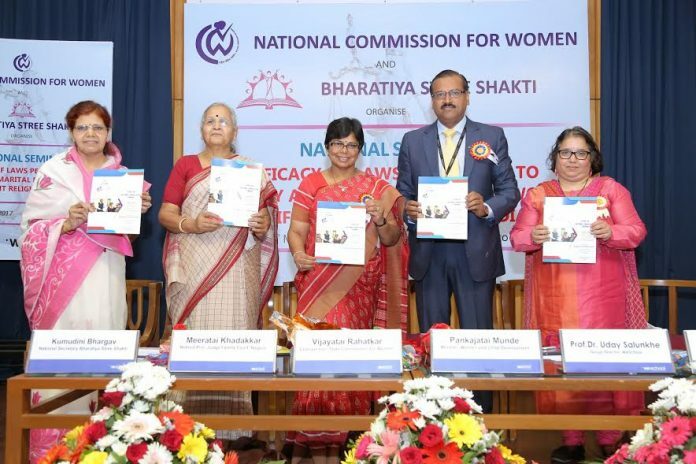 In her welcome address Kumudini Bhargav, National Secretary, Bharatiya Stree Shakti reviewed the tasks undertaken by the NGO towards empowerment of women through various initiatives in education, health, economic independence, equality and self-respect. Due to the proactive initiatives taken by the Maharashtra State Women Commission towards support and rehabilitation of the victims of acid attacks, leading hospitals are coming forward to give them treatments like cosmetic as well as plastic surgery free of cost, sensitization of industries is helping them in getting employment and to regain their rightful place in society, she added. While Meeratai Khadakkar, Retired Prin. Judge, Family Court, Nagpur delivered the keynote address, a report titled, “Smart Cities With A Focus On Inclusive Gender Development” based on the findings of a national consultative seminar held earlier was released at the hands of Vijaya Rahatkar, Chairperson, Maharashtra State Commission for Women and Prof Dr Uday Salunkhe, Group Director, WeSchool. Along with Meeratai Khadakkar, Judge (Retd) Bageshri Parikh, Shamsuddin Tamboli of Muslim Satyashodhak Mandal, Viney Kapoor, Commissioner, RTI (Punjab), Judge (Retd) Sunanda Joshi, Adv Girish Godbole, Adv Anjali Helekar participated in the subsequent sessions to elaborate on the diversity of facets and issues faced while safeguarding the rights of women and set guidelines to establish good practices for effective implementation. Dr Prachi Moghe, Convener of the seminar, Nirmala Apte, Varsha Pawar-Tawde, Ragini Chandratre, Nayana Sahstrabuddhe, Rajashri Nagare from the Bhartiya Stree Shakti Sanghatana had taken the lead in organizing the seminar while eminent advocates like Ram Apte, Jaee Vaidya, Prof Dr Rajadhyaksha, Prin–New Law College and Prof Vaishali Gurav, Balasaheb Apte College had contributed as the advisors of this national seminar.